This Place of Worship was founded in 1907, but we understand it was closed in 2016. Christian Science services for the Derby area were held for the first time in Alvaston in 1907, with those in Friary Street in beginning in 1915. The impressive building we see in our photograph, built in the 1930s in 'Arts & Crafts' style, is very much a 'child of its age', opening its doors for the first time in 1937. 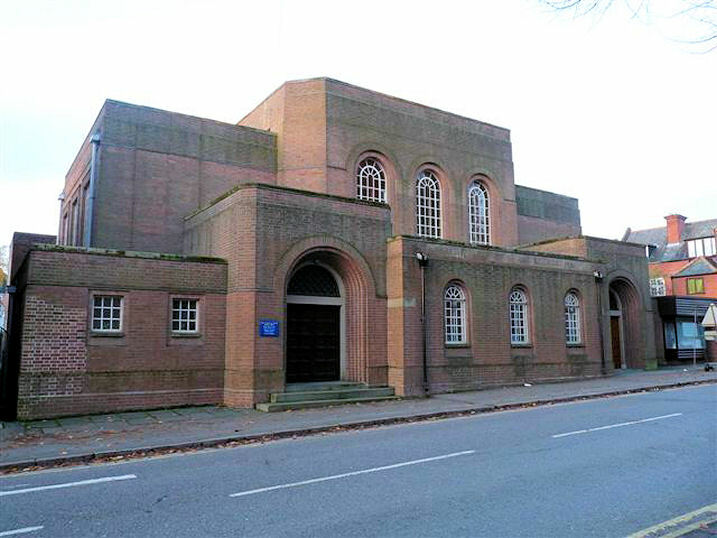 More details of its structure may be found on the British Listed Buildings website. This account was prepared originally in 2010 when it was still open for worship; however since then it has closed, and its congregation have moved to the Bosnia-Herzegovina Community Association premises in Curzon Street. Their FaceBook page says the move was effective from 21 Aug 2016, and the Curzon Street premises are temporary. Meanwhile, the building in Friary Street is currently (2018) believed to be in commercial use, as a restaurant. Note: the Christian Science is a Bible-based teaching established by Mary Baker Eddy (1821-1910) in about 1866. The movement fosters spiritual thinking and healing. Now or formerly Christian Science. First Church of Christ, Scientist, Derby shown on a Google Map. Information last updated on 18 Sep 2018 at 13:07. This Report was created 8 Apr 2019 - 19:43:52 BST from information held in the Derbyshire section of the Places of Worship Database. This was last updated on 6 Feb 2019 at 15:49.